Genomics, Medicine, and Pseudoscience: How disruptive are MOOCs? Hopkins launches new genomic data science series. 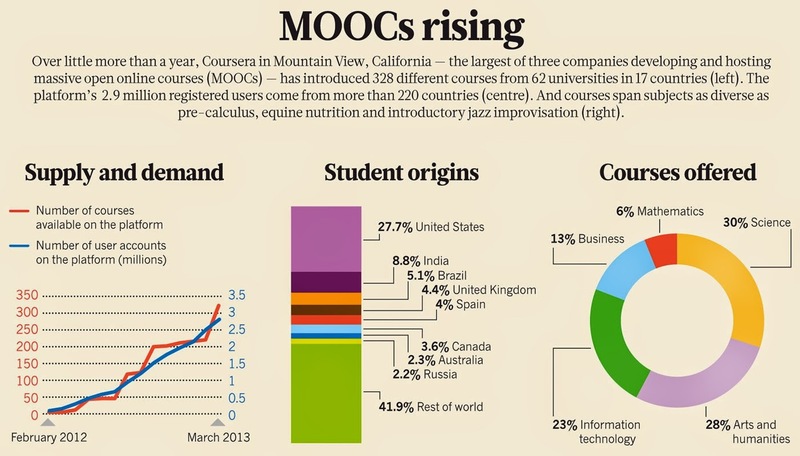 How disruptive are MOOCs? Hopkins launches new genomic data science series. If you could visit a college classroom a hundred years from now, would you expect it to look just like one of today's classrooms? Yet if you walked into almost any college classroom today, you’d see a scene right out of the 19th century: students sitting in a classroom listening to a professor talk. Perhaps the professor is using a laptop to project slides, rather than writing on a chalkboard, but other signs of the 21st century can be hard to find. Of course the content today is different, particularly in the sciences–no one even knew what DNA was 200 years ago–but the way we teach has barely changed in the past two centuries. Well, it’s changing now. The advent of massive, online open courses (MOOCs) is making high-quality content available to millions of people for the first time, and much of it is free. These online courses, even in their infancy, have generated a huge response, revealing the hunger out there for learning. Professors too are discovering something: how rewarding it is to reach thousands of students rather than just a handful. And capturing lectures on video allows us to mix and match material, updating just the parts that need changing and re-using the good stuff with relatively little effort. One of the first questions people ask me about MOOCs is, how can you offer all this content for free? Isn’t this a threat to the traditional university model? You bet it is. But it’s happening, whether universities like it or not. As with other disruptive technologies, MOOCs are likely to change dramatically over the next few years, but they aren’t going away. We're just learning how to deliver knowledge through MOOCs and we’ll get better at it. Right now MOOCs exist in a separate world from universities, but that’s likely to change. Maybe the experiment will fail, and MOOCs will fade away. Maybe that classroom in the year 2115 will look just like my classroom today. I’m betting it won't. I've taken some moocs and have to admit they are useful, if not the perfect replacement for University lectures. But it is interesting how so much criticism is lumped on them by faculty with a primarily teaching orientation. Some of them claim that moocs simply copy the traditional lecture classroom and aren't based on the latest teaching fad of "flipped classrooms" where there is an interactive dialog between the teacher and students performing activities in class rather than a lecture. I can't say that the flipped classroom seems that attractive to me on either side of the podium - it reminds me a bit too much of grade school.